This is a good story which kept my attention but I am missing too much backstory to fully appreciate or understand it. 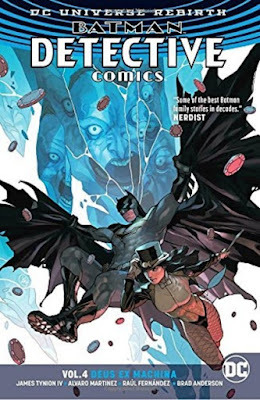 First, it was great to see Zatanna again. I haven't come across her in a great while and I enjoy her. But I didn't know she and Batman had any backstory together so her previous crush on him was news to me. Secondly, all I know of Jean-Paul is as a part of this team. I know nothing of his backstory or Azrael. Since Azrael is the major plot point of this arc it will certainly be better enjoyed by those who know Jean-Paul's background. One exciting part is the big reveal at the end which hints at what will come in the future for the Bat-verse and secondly, a one-off at the end introduces us, through a reveal, of a new anti-hero who was formerly a hero.